So yeah, today’s look has some sock game for sure … and instead of shyly peeking out, these babies are showing off! I’ve seen other bloggers do socks with booties and decided to give the trend a spin. What do you think? Shelbee of Shelbee on the Edge gave me the inspiration for the cargo jacket and striped top. And Anna of Happy Medley is rocking her booties with socks look. Also the amazing Miss Monika of Style is my Pudding definitely has some sock game going on! Link up, link back, visit & have fun, Dolls! And as always, thanks for being part of Fun Fashion Friday! Link ups: Visible Monday! Shoe and Tell! #iwillwearwhatilike link up! Hello Monday! Mix It Monday! How I Summer! Creative Mondays! Let It Shine! Elegance and Mommyhood!Turning Heads Tuesday! Confident Tuesday! Bloggers Who Inspired Me! Tuesday Fashion Party Celebrate Southern! Trendy Wednesday! What I Wore! The Wednesday Pants! Color and Grace! Throwback Thursday! Thursday Fashion Files! Labour of Fashion! Thursday Favorite Things! Top of the World Style!Welcome to the Weekend! Passion for Fashion! Fabulous Friday! Fab Favorites! Friday Favorites! A Little Bit of Cheer! Forage Fashion! Link Party with Osy! Lifestyle Link Up! Flashback Fashion Fridays! Changing Tides! Aww, that's so cute!! I'll be the kids get excited to see what Ms R is wearing and you're the most stylish teacher there!! Love that the socks are leopard print. You look casually adorable!! Happy weekend gorgeous!! Socks are such a fun and unexpected way to kick up your outfit! You look so cute – love those leopard socks!! Leopard is so much fun, I love styling my looks with animal prints! Fun fab look – socks are indeed game changers! Great idea, fun socks. Have a wonderful weekend! These leopard socks peeking out are SO dang cute! I need to do this! I really like socks! I wear em under jeans and those are some cute socks ! I love the dark denim and the cargo jacket . Those boots are favorites, i love the suede and the taupe neutral color, plus they look comfy Looking fab!! Great casual look! Love & love the socks! what a fun post! 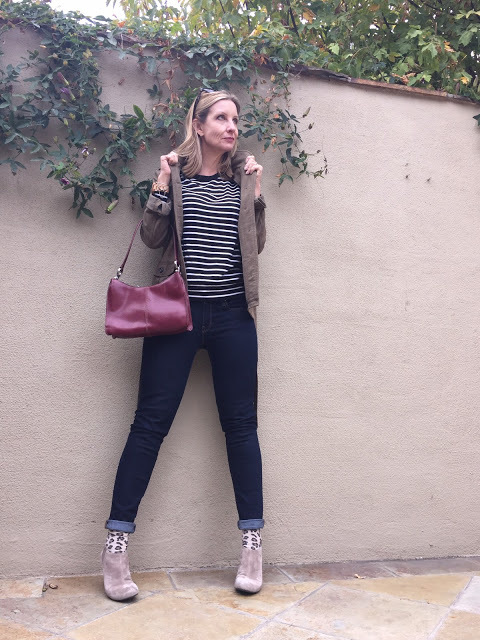 lots of cute fall looks! Love your sock game! This jacket and striped top combo is so fun. OMG! Dawn Lucy, I love your sock game! I am a total sock addict (definitely check out the site SockDreams.com!) I never thought of pairing cute socks with booties either, but now I have to try it. 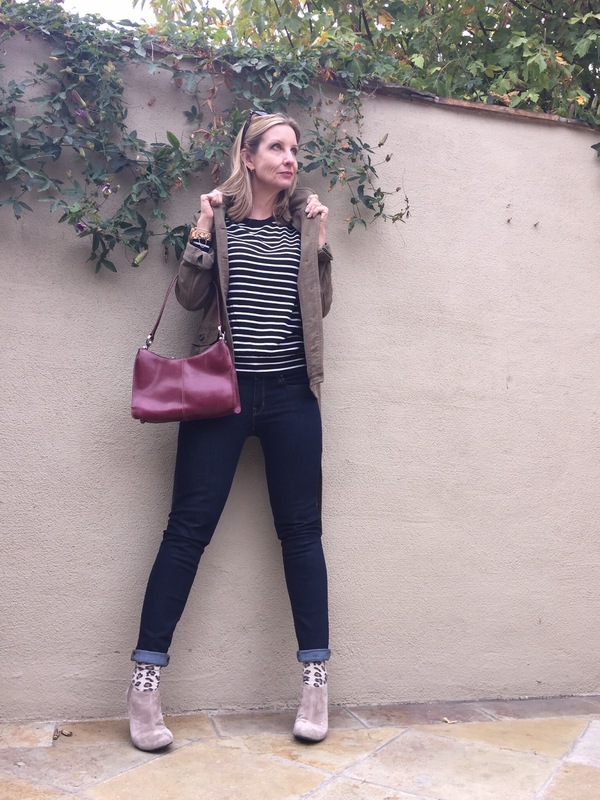 And thanks so much for sharing my cargo jacket and stripes look! I am totally flattered and glad I could inspire! Also, I wanted to let you know that I have highlighted you in my weekly blog post Little Bits of Inspiration! (BTW, I had this drafted before I found out that I inspired you as well! Funny! But I publish it on Saturdays!) So, thank you, Dawn Lucy, for always inspiring me! Another great link up and outfit! I could lever have thought to wear my socks above my booties! I can't wait to try this out. You know I love funky socks 😉 So I'm happy each time I see a fellow blogger pull out their sock game 🙂 Now that it's appropriately cold here, mine will come out too play as well. LOVE your socks and booties!! Great look! I dig your sock game. They are fun, aren't they? I also enjoy having an interesting sock peak out. Such a cute look with the leopard socks peeking out! I need to try this! I love your leopard socks! Thanks for the link up, Dawn! Have a wonderful weekend. How cute! Love those socks! I love the whole outfit! Your socks and boots are so cute together. The whole outfit is adorable. And great minds think alike because I am also doing socks with neutral suede boots. Your socks are so cute, too. This is the "sock game" done WELL! Great job. I'm inspired. I've been nervous about pulling off the socks peaking at my ankles with me new oxfords (you can see them in my latest blog post :)). Now I'm going to do it for sure. I truly love this look!! You just can't go wrong with leopard print socks 🙂 Loving your booties too! I so need a pair. Fabulous look and your sock are so cute. That is the cutest socks peeking out of bootie look if I ever saw one. Love the leopard print. It's a small detail but makes a huge difference. 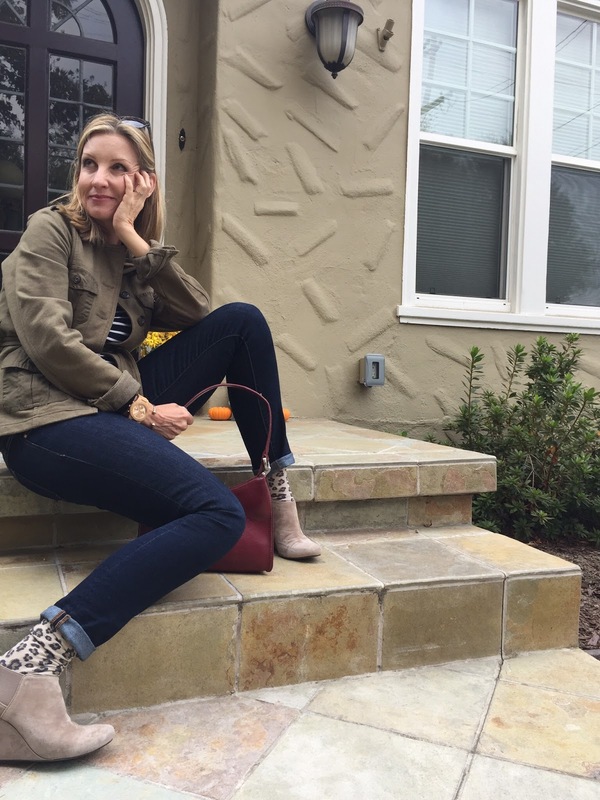 Love your look – the army jacket, the stripes, the ankle boots and the leopard socks – fabulous!!! Thank you for hosting. I love wearing socks with booties! Its a great opportunity to wear really fun socks! Your's are super cute! Socks are accessories just like jewelry. They give you an opportunity to be silly, or elegant, or quirky, or flamboyant. I love a great sock, and yours are terrific! Love those cheeky socks! Bonus points for pattern mixing! Ooh loving those socks! What a fun idea! Thanks so much for linking up with Friday Favorites! Hope you have an amazing week ahead of you! The socks are such a great fun touch. I mean leopard print is always a winner but it's even better when done in socks with those wedge boots! Nicely played! Love the whole ensemble on you. The socks are such fun and I love those wedge shoes. You look great. Is it bad that this is the first time I have seen this trend in blogland, and you are rocking it Dawn, love those socks. Howdy, Gorgeous! Yup, you gotz game. So cute, and have been thinking of trying this … I don't own a pair of socks anymore, though, Several singles with no mates, so I need to remember to actually shop for them. I've been determined to wear them with a pair of sturdy sandals I just love and didn't wear much this summer as they looked less than warm-weather appropriate. Might work. And certainly with boot tops. Thinking of using them with crops in patterns and textures but same as bootie and pant to keep my shortie leg line from chopping off. Good reminder for me! These all dresses are rocking. combo of everything in each dress is perfect. I really liked the dress in first pick blue jean, jacket, footwear and especially socks. I want to see myself in this whole dress. Good looking outfit. Your socks are funny and matching. I always wear a funny socks on different occasions.